There are numerous applications where additional headspace takes priority over floor space. 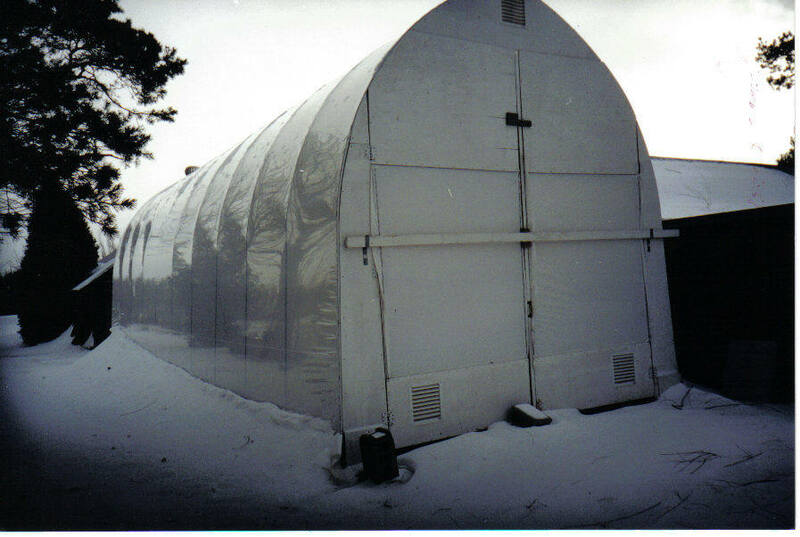 Multi Shelter Solutions has a CATHEDRAL shaped structure which is the result of simply taking a regular profile arch and reversing what is typically the top and bottom. This is another example of how our innovation creates a “custom” structure at standard pricing. This profile is our most snow resistant model. 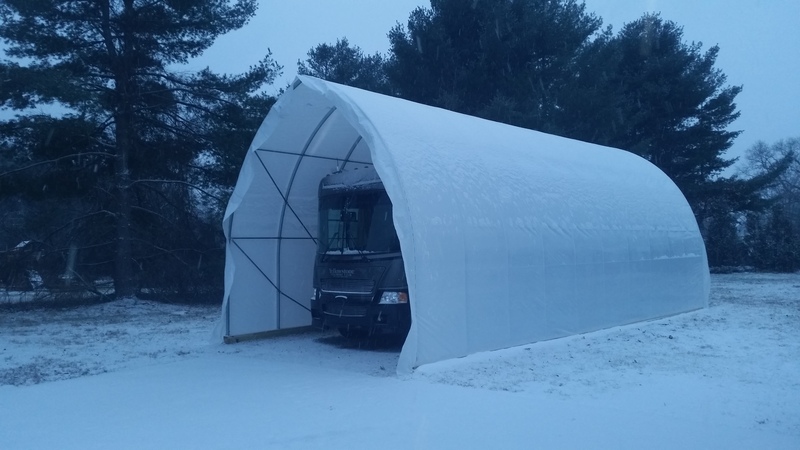 The 4 basic sizes combined with any length allow virtually any vehicle to be covered economically. As in the above photograph, the cover is usually opaque, to allow light to come in but not sunlight which would allow fading and other harmful effects. The base is typically a pressure treated 6×6 or railroad tie pegged to the ground. Rather then construct large, expensive access doors, many of our customers build a simple closed end with small man door. This is dismantled during the operating season and reconstructed for the winter time. The big difference is that with TARP you get extremely high tear resistance with good annual cover cost, and with PLASTIC you get slightly less life span but even less annual cover cost. We get many requests from customers who would like an economical way to protect their investment in their RV or trailer. The straight wall of the MSS Cathedral shaped structure creates a perfect solution for those who need head space more then floor space. Even though this is our most snow resistant model, the hoops are placed slightly closer than typical due to the wind loads. The opaque white tarp or white plastic cover lets in a good level up light while still protecting stored vehicles from fading and other harmful effects. The simplicity of the required base allows you to keep your options open. A 6×6 (or equivalent) timber pegged to the ground is all that is required. This allows easy relocation if circumstances change. Usually the back wall is framed in with studs and covered with one of our durable covers. The “finishing touch” can be a simple roll up door which allows the whole end to open up. When finishing the ends the should be a small vent near each peak to allow the building to get rid of excess moisture. Plan Now & Enjoy the Nice Weather! While we are enjoying the nice weather of the summer, it’s always a great time to be thinking of your late summer and fall projects. Often we hear people rueful that they were not able to get their structure up before snowfall since winter always sneaks up. What better time to plan for those projects than now! We have many wonderful weather days for installing, rather than having to settle with a less than ideal day to put the building up and especially fasten the cover down. Friends and neighbours would likely be more willing to help as well. These buildings are great for storing the hay and other equipment for your farm. They can cover your swimming pool to extend your season into late fall/early winter. Park your RV, boat or other fun summer toys over the winter to keep them protected. Plan for a garage so this will be the year you don’t need to brush snow off your vehicle. There are so many great uses, call us today to discuss your project requirements and out there ideas! The fall is always a busy time here at Multi Shelters. We would love to help you with your 2017 project, and we hope to hear from you soon!